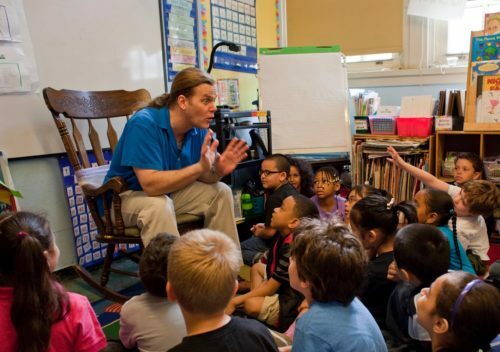 Taylor Mali can teach different kinds of workshops/lectures for a variety of audiences. Poetry writing workshops can be as short as 30 minutes or as long as two and a half hours (or longer in special circumstances). Typically they involve a series of writing prompts with time built in for composition, recitation, feedback and revision. More performance-based workshops, which could be suitable for a drama class, involve less writing and more poetic improvisation, tips for articulate presentation and theater games. Writing workshops for teachers are essentially explanations of poetry prompts that teachers can use with their students. Taylor will discuss two or three prompts for every one that he makes teachers actually do. Taylor has a substantial collection of spoken word audio and video clips that he uses to discuss the difference between poetry written for the page and poetry written for the stage. Taylor loves to talk with teachers, to inspire them, energize them, and remind them why they chose to walk the noble path they walk. Many schools take advantage of Taylor to meet with faculty and teachers and help “refill the well.” These meetings can vary depending on the time allotted and what the school needs. Sometimes it is as simple as Taylor leading a Story Swap at the end of the day (or in place of a regularly scheduled weekly faculty meeting) where veteran and new teachers get to share stories of great triumphs and enlightening failures. Or Taylor can give a more formal lecture on the nobility of teaching that includes some of his more well-known inspirational poems about teaching. And then there are workshops about how to teach poetry to students (mostly of interest to Language Arts teachers).